The popularity of spray tanning has exploded over the last decade through the United States and the world. We have seen an increase in the number of spray tanning businesses, especially in our local community. The best thing about this business is the fact that you can get started quickly, and with the proper spray tan training, equipment and business expertise, you can start a successful business. Our definitive guide to starting your spray tan business in 2019 will cover all of the details necessary to take action and start your spray tan business today. Yes! Give me my PDF! 2 What Is Success To You? 4 What Type Of Business Do You Want To Own? You would be hard pressed to search your local community and not find a spray tan businesses with 3-5 miles of your home. With the increased popularity of spray tanning, over traditional tanning options, we have seen a lot of new business owners get started in the community. People that have never owned or operated their own business are now ordering their spray tan kits, taking training, and then launching their own business. It is great to see so many people following their dream and doing something that they love. The thing that is not so great is the fact that many of them have no background in business. This makes it extremely challenging for some people to create and sustain a business. When the times are good, they are great! However, when the slow season hits, we see a lot of businesses retreat and give up on their business. You may ask why I included people that are already operating their spray tan business. The reason being is because a lot of people did not create the best foundation for their business and it will help them to go back and fix some things to set their business straight. I’ve spoken to hundreds of business owners who just seem to be overwhelmed with everything that it takes to run a successful business. The fact of the matter is, it takes a lot of hard working, dedication and persistence, just to name a few. Throughout this ultimate guide, I will give you some foundational elements that can really help you start your business off “on the right foot”. This could make all of the difference in the world for the path your business takes. We can send you a copy of this article in PDF format! It may seem strange that the first thing mentioned for starting your spray tanning business is mindset, however, it is completely necessary. I have seen a lot of people get into business not knowing what to expect and then when they hit their first “road bump” they are completely thrown off-course. And that is why I like to start with setting the proper mindset. As with any business, you must expect that there will be ups and downs. In fact, in the happytans podcast I ask all of the guests to talk about their lowest and highest point in their business so far. The reason I do that is because I want business owners to hear what other “successful” people have gone through. You see, owning your own sunless tanning business is great, but it is also challenging. For those of you who have never owned and operated a business, it is important to understand that everything will not always work out the way you want, you will receive feedback from your customers that may rub you the wrong way, you may give a bad spray tan, but these are just stepping stones in your business. Most people linken starting your own business to launching a shuttle into outer space. What most people don’t know is that when these shuttles launch they use up around 90% of their fuel just to get off the ground. To me, business is very similar to these analogy. You will have to put in a lot of time and effort to get your business started, but it will be well worth it. The overwhelming majority of them mention the fact that they wish they would have told themselves to be patient, to not give up and to know that reward comes to those that work hard. Starting your own business takes hard work, but it is possible and it is worth it! When I talk to business owners I like to ask them about their business and find out what they are aiming to achieve with their business - what is success to them? I want to understand what it is they are aiming for and why. One of my favorite interviews on the happytans podcast was with Jenn Dieas. She talked about how important it is for define success for yourself and she is right about that. When I started the happytans podcast, I want it to be interviews with the most “successful” business owners. Since I’ve started interviewing more and more business owners, that definition, to me, has changed. That is because each and every business owner has a different goal for their business. Some of these business owners want to own and operate a major salon/spa in their city. Some want to open multiple locations across the US. And then there are some who just want to have some flexibility in their business and life so they can spend more time with their family and friends. That question will allow you to actually determine what it is you want to get out of your business. Make sure that you are working towards what you want, not what everyone else wants. I get it, it may be a little early to actually start defining goals for your business considering you don’t even have a name picked out yet. Goals are something that you will hear a lot of the most influential and successful people on the planet talking about. They are always writing down their goals, both short-term and long-term. They want to make sure that they keep the ship pointed in the right direction. How many people do you want to spray per week? What type of clients do you want to attract? Do you want to only work by yourself, or do you want to eventually manage employees? These are just a few questions that most spray tanning business owners consider within their business. Now, like I said, it may be too early to determine your exact goals, but it is important to have some kind of baseline and understand where you want to go with your business. Understanding the answer to that question can help you determine what the goals are for your business. Spray tanning offers a number of different types of businesses for you to start. I like to tell everyone about all of the options and opportunities within the industry and from there they can decide which options is best for them personally. We see a lot of people that have a mix of some of the options above. Each one of them has pros and cons and what works for you may not work for everyone else. Deciding on the type of business you want to own and operate will determine the type of equipment that you use for your business. More on this later! It is time to actually put a name on this new business that you are starting. This is one of the most exciting things during the process, but it is also a place where a lot of people get stuck. While it is important to choose a good name, don’t get too caught up here. My best advice is to use something that fits with your personality and something that is catchy and unique. I have seen thousands of business names and a lot of them follow common themes, such as, Bronze, Bella, Glo, Glow, etc. While some people have used these words and made some great variations of them, most of these names are taken. Another advantage you have is the fact that you will typically only be doing business in your immediate local market. If you look around the world, there are a lot of businesses that have the same names, but since they aren’t necessarily “competition” it isn’t a big deal. Now that may sound a little contradictory to what I said previously, but I always give people the advice to try to come up with something unique and something that fits their business and brand. In the end, you need to make sure that the name is catchy and is something you like and represents you and your business. While I tell people not to spend too much time on this, I also suggest to get it right from the start. It is challenging to change the name, although people have had to do this in the past. The legal structure that you choose for your business will have an impact on your business, including taxes, registration requirements and personal liability. If you have never started a business before, this can be overwhelming. But that is why we are here! If you do a Google search for legal business structures you will see a number of options that you can choose from. The good thing is, we don’t need to worry about all of the options because the most commonly used business type is a Limited Liability Corporation, better known as an LLC. A lot of people that start a business don’t establish a legal structure and run the business through their own person, which is known as a sole proprietorship. While this business structure requires little to no setup, it provides zero protection for you as the business owner. What an LLC does is it allows you to create an entity separate from you and thus is provides protection for you. If someone is to come after you, which is highly unlikely, you are personally “shielded” by the LLC. The LLC essentially provides a layer of support between you and the business. This not only helps for those rare situations but it also helps if your business is to absorb a loss. The LLC would be the one that absorbs the loss, not you personally. If you operate your business as a sole proprietor, you’ll be taxed as a self-employed person, and the income of your business is considered your personal income for tax purposes. An LLC, however, can be taxed as a sole proprietorship, a partnership or a corporation. An LLC may make an election to be taxed as a corporation; if such an election isn’t made, it’s taxed as either a sole proprietorship or a partnership, depending on the number of members it has. It’s probably this potential of an LLC to be taxed as a sole proprietorship which often has people wondering if an LLC is a sole proprietorship. It’s not, but for tax purposes it may be taxed as one, depending on the circumstances. *Please note that I have no legal background and can not provide you with professional legal advice. Each person should consult a lawyer or attorney. Now that you have decided on a business name and legal structure, it is time to register your spray tan business with state and local governments. Registering your business depends on a number of factors that are unique for each business structure and state. It is important for you to do some research for your specific situation. You can find out more by reading on the Small Business Association (SBA) website. This is another common step that a lot of new business owners may skip but something I believe is necessary to protect yourself and your business. This includes two things; insurance, and a consent form for your clients to sign off on. With any type of insurance the hope is obviously that nothing will ever happen. However, things do happen, especially when you are applying anything to your clients skin and going into the homes of your customers. It is always a good idea to protect yourself and your business. Creating a legal business structure for your business, and purchasing insurance will help to keep you personally shielded if anything were to happen. One of the last things you should have for your business (but not least!) is a consent form for each and every client to sign off on. This form basically protects you in case your client were to have an allergic reaction to their spray tan. This is not something that happens very often, however, anytime you are applying anything to someone's skin you always want to make sure to cover yourself. You understand that the spray tan solution contains bronzers that COULD potentially rub off on clothes, seats, sheets, couches, etc. As you can see, this form can be really extensive, but this is necessary to protect you and your business. Again, I am not in the position to advise you on any legal items, so it is up to you to consult with an attorney or lawyer and to help you draft and approve a consent form. I am the first person to tell you not to pay attention to your competition because I believe that if you focus on your competition, you will only copy what they do. Your business will be a carbon copy of their business. So why would the customers come to you? I also believe that you need to focus on your customers and not your competition. Every second you spend analyzing your competition is time away from serving your clients. However, when we are first starting out it is important to do a quick check of the competition to get an idea of what they charge and what will work in your local area. Every single area is different. There are some spray tanners that charge $20 per tan, while others can charge up to $300 per tan. It is completely different for each and every business and most of the times the price is directly associated with where you live. If you live in Los Angeles, CA, you can probably charge more than if you live in a small city in Idaho. The other reason I want you to look at your competition is to find out what they are doing wrong. Why should we focus on what they are doing wrong? Because, that will give us the opportunity to fill in that void and do what they aren’t doing. 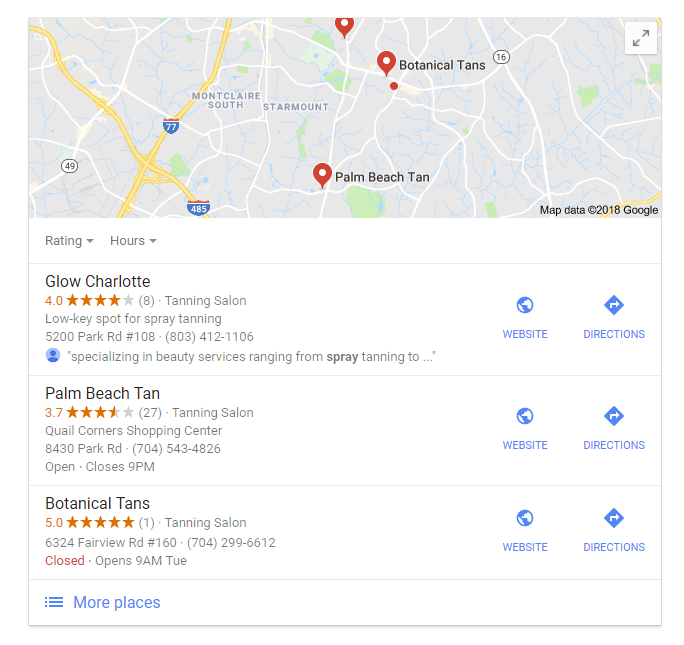 I’ve researched a ton of spray tanning businesses and most of the negative reviews have to do with the customer service they provide, or the products that they use. Both of these things are easy to fix. First, you need to find a good product that your clients love and that works for your spray tan technique (more on this later). Secondly, you need to make sure you provide the BEST customer service possible. By the best customer service, I mean the absolute best. There is an amazing statistic that says 90% of businesses think that they provide exceptional customer service and only 8% of customers say that they actually receive exceptional customer service. So figure out what you are going to do to go above and beyond and provide the best customer service they have ever experienced. Think back to a time that you went to a nice restaurant or somewhere that had exceptional customer service and do that. Find out how you can set yourself apart and use that as the main messaging for your business! Want more awesome info like this? There are so many businesses out there who don’t know who their ideal customer is. Most spray tan business owners have never considered this, and that is a huge mistake. Let me tell you why. It is rare to find a business that really excels if they are trying to serve everyone. The challenge is that your messaging, branding and the voice of your company can’t possibly resonate with everyone. For example, if you are wanting to provide spray tans for stay-at-home moms and also cheerleading teams, how would you market to both of them at the same time? It is nearly impossible. These two examples above show you how different the language would be for each client. You can, however, create multiple client avatars and use that to make sure when you do create marketing collateral that you do it correctly. Another example I like to use is clothing companies. Does Abercrombie and J. Jill both sell clothes? Yes, they do. The only difference is who their ideal customer is. 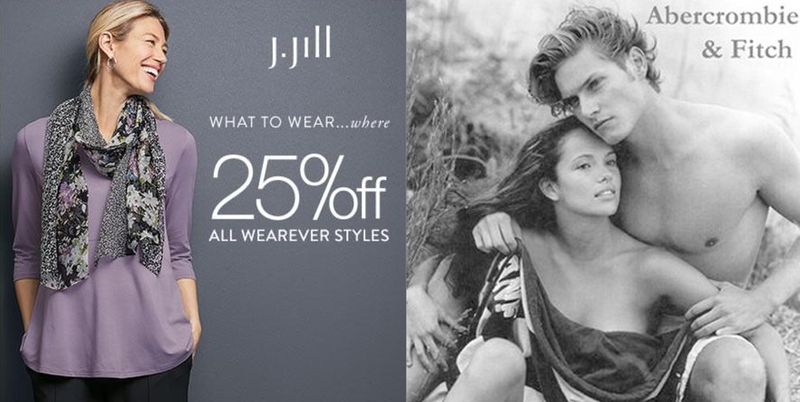 Abercrombie markets to a younger clientele, while J. Jill focuses on mature women. If they were to present an Abercrombie ad to a bunch of J. Jill customers, would it resonate with them? Nope, didn’t think so! Here is an example to show the vastly different "client avatars" they have. I know, this is a lot of detail! But can you image how much easier it would be to market your business when you have laid out exactly who they are? You can write the messaging like you are speaking directly to your client avatar. Your messaging will be spot on! “How does this person know that is exactly how I feel/exactly what I need?”! If you ever have had that experience, I can guarantee you that they are a great marketer because they know exactly who YOU are and how to market to you. I remember sitting in one of my college business classes and listening to the professor talking about the importance of a business plan. I had read a few in the past and even had to create my own for a Self Storage company. The business plan was a long, boring document that, to me, really was too much for what we needed. However, these types of in-depth business plans are necessary for those businesses that are getting a loan or are funded by an external source. The good news is, we don’t have to worry about that. Whether you are going to be a mobile spray tanning business, or open your own location, I promise you won’t need to write a long, boring business plan. Instead, we are going to utilize a great resource that was put together by an entrepreneur that I follow. What he did was break down the business plan into a simple, one-page document. This way you are not overwhelmed and you can sit down for 10-15 minutes and be done! This is all you need! So far we have talked about a lot of operational and foundational elements that are used to start a business. These aspects can be used to start a business in most industry, in fact, business is business. What I mean by this is that if you understand business and marketing, you can succeed in any industry. In this section we are going to talk about spray tan training & certification. Some people may have already completed this step before now, but I like to lay things out in an order that makes sense to me. So, if you’ve already completed this, no worries!! Just a few years ago it was challenging to find any type of training and certification program for spray tanning. Now, there are hundreds of them. The truth of the matter is that since spray tanning is unregulated, anyone can offer a “certification”. As of right now, Oregon is the only state that requires any type of prerequisite in order to spray tan. In Oregon, you must be a licensed esthetician in order to offer spray tanning (legally, of course!). With that being said, it is important for you to find a training program that works for you. There are in-person and online training options. For some, they may be able to learn online without the hands-on training, while others may require the hands-on training in order to be comfortable with the spray tan process. Regardless, you need to decide which one is right for you. A lot of people decide to do an online spray tan certification program because there are no trainers around them and they can’t afford to travel to a trainer, or pay a trainer to come to them. To me it is pretty obvious that an in-person training program would be ideal for most people. Hands-on learning, especially with spray tanning, is important. If you can afford to get training in-person, do it! Most training programs cover a plethora of information and will bring in live models to allow you to perform an actual spray tan on a live person! Don’t worry, there is training solution which washes off and doesn’t cause the person to actually “tan”. While online training may not be ideal for everyone, it is the only option that a lot of new business owners have. There are a lot of online programs out there that will essentially teach you the same thing you learn in person, just without the actual hands-on training aspect. It is up to you to gather your own “models” and go out and practice! How long have they personally been spraying? Can I speak to some past students? What if I have questions once it is done? These are just a few of the questions that I would consider if I were looking to find a training and certification program. The biggest questions for me personally would be asking what happens once the training is complete. It is always good to have on-going support and also some online videos or some resource that you can refer back to. Spray tanning history - how/where did it start? Obviously, I could go on with this list forever, but you get the idea. Your training program should include a lot of valuable information, and you should leave there feeling completely comfortable with going home and getting started! What type of training do you prefer (online vs. in-person)? What is your budget for training? Who do you want to train with? Do they provide you with assistance after you leave? Take your time and make sure you chose the program that is best for you! You can also read our Ultimate Guide to choosing the right Spray Tan Certification course for you! Another question I get all the time is about which products are the best, and which products work for this and for that. Again, this is a question that I often avoid. The main reason being is because each and every technician will have their own technique, therefore, every product will work differently for everyone. Not to mention, there are also a ton of external factors to consider, such as climate. People in hotter climates usually don’t want to use a product that is aloe-based because they are often “tacky” and “sticky” due to the aloe. 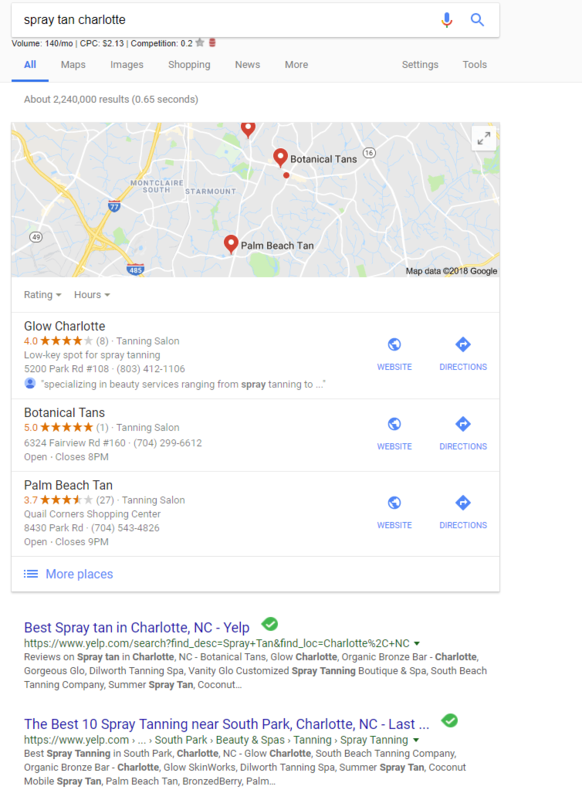 If you go to Google and search “spray tan solution”, “best spray tan solution” or anything similar, you will come across a TON of websites that all provide sunless tanning products. But how do you know which are the best? As you can see all of these factors make it challenging to say a blanket statement, such as “this is the best solution on the market”. My suggestion for you is to do some research online and find out which products and companies you like. From there, you can request (or pay) for samples of these products to try out. Don’t go crazy though, I recommend just finding 3-4 products and giving them a try. Try them on multiple people so that you can get feedback from more than one person. From there, you will be able to narrow it down to two or even one product for you to use. My suggestion is to use the one that got the best feedback from your clients. If you ask other technicians you will here a lot of different answers when you ask about their products, how many the carry, what they use, etc. This is another situation where what works for one will not work for everyone. Some technicians only spray a certain type of client and skin type so they only carry one solution. Some technicians carry light, medium, dark, extra dark, and more. You have to determine which products and range you need to carry in order to serve your clients. Occasionally technicians will perfect their technique and adjust how they spray depending on the clients skin type, and from there, they will only use one product. It is always good to keep a rapid solution on hand. For those of you who don’t know, the rapid solution has an extra ingredient added to it so that the tan takes to the skin a lot faster than the normal solution. This does not change the actual development time, but it does allow the client to shower a lot sooner. Usually around 1-4 hours depending on the type of product you use. These products are great for your on-the-go or last minute tanners. A lot of your clients may not want to sit around in the solutio all day so the rapid is a great choice for them. The other scenario where it makes sense is for those clients that come early in the day and don’t want to have to wear it all day. Most of these rapid products are one “level” and it is up to you to tell your clients when to shower. From your experience, you can determine the length of time they should keep it on based on their skin type. This will allow you to control these areas a little better. Again, some technicians will love this product and others won’t use it. pH balancer is just what it sounds like. It helps you to level out the pH level of your clients skin before you spray them. Most people are going to be more acidic than alkaline, so we want to bring their skin back to around a “7” which is a happy medium for their skin. Also, some pH balancers contain aloe which helps to moisten the skin to better absorb the spray tan solution. Each pH balancer is different, so do your due diligence and figure out which is best for you! These additives are a great way for you to make your clients feel special by customizing their tan. This can help separate you from your competition! Note: There are additional things you will want to have for your business, including a tent, sticky feet, nose filters, etc. We will explain that in more detail in a different guide. Oh yes! I forgot, we must spray this solution on with something...a machine! There are a number of options out there for you when you get to this step. A quick Google Search will bring back a HUGE number of results. And yes, you guessed it, this can be overwhelming! The good news is, it doesn’t have to be. I like to make things simple for you. So here it goes. If you are just starting out you want to make the right decision before you invest in a machine and rightfully so. You are about to invest a pretty penny in a machine and you want to get it right! Yeah, that’s right, I just simplied your decision! I know, I wish it were that easy, but you still have to go out and do the research. And even when you decide what you want, I am sure you will still questions whether or not that is right. The loudness of the machine is really important for a lot of spa owners because they usually have other services in their salon and don’t want everyone to hear it. While some machines may claim that are “quieter” than others, I have found that the difference in the sound isn’t noticeable to the human ear. You can, however, purchase or make a quiet box which will help to muffle the sound. This is something everyone asks before they buy a machine. In fact, when I worked at Sjolie Tanning people would always ask how many tans they could perform in a row. Most of these machines are built to handle whatever you throw at them. The main thing to consider, and pay attention to, is to let the machine cool down as much as possible in between tans. A lot of the machines run hot because they produce so much power. Also these quiet boxes can sometimes cause them to run even warmer, so be careful! The weight of the machine is extremely important for those of you who are going to be doing mobile tanning. If you can get a machine to weigh at or around 10 pounds, you will be golden. The good thing is Apollo, along with other manufacturers offer machines that are this light. Most of the equipment out there will come with either a plastic or stainless steel/metal gun. Which is best? Neither. It is all personal opinion. I know plenty of spray tan business owners that love the plastic gun because it is much lighter and your hand and arm don’t get as tired. On the flip side, plenty of business owners love the stainless steel guns. Usually the plastic gun will be a more broad spray, whereas the stainless steel gun will be a finer mist. My opinion is, you will start with a gun, you will get use to and perfect your technique with it. So decide which one fits in your budget, and go with it! Let me go ahead and tell you this. While it is important to purchase the machine that is best for you, your machine does not determine the success of your business. My second podcast interview was with Andressa from SunMist Orlando. She shared her story including the fact that she has been using some old, industrial machine for her spray tanning business for years. Has it affected her business? Nope, it sure hasn’t! In fact, her salon is voted the #1 spray tanning spot in Orlando year after year. So why am I telling you this? Because I don’t want you to go out and spend a fortune on a machine will that alone will not determine the success of your spray tan business. This is an important and fun step in the process. This step is associated with #5, Name Your Business, because you will use that to start branding your business. My best suggestion here is to pay someone who is a professional to help you design your logo. You can spend anywhere from $20 - $1,000 on a logo. The good news is a lot of these logo designers will also help you with other items that are listed above. I know these are multi-billion dollar companies, but why not learn from the best? The brand colors will most likely be extracted from your logo. I recommend 2 main colors, that will accompany the basic colors, such as white and black. You can use these colors with everything you do in your business, including decorating, letterheads, emails, and more. I know, that isn’t the best or most creative, but hey it just came to my mind as I was writing. Some companies use a single word or simple phrase as a slogan. It is up to you to decide on something. This may be something a lot of people have never considered with their business. However, it is important to use the same fonts on all of your marketing collateral, including business cards, rack cards and website just to name a few. This creates consistency which is essential for any business. I am sure a lot of you are wondering what I mean by a “voice”. Basically, we want to create a voice so that our marketing messages are consistent. If you look at a lot of the big brands and companies in the world, they have a voice. For instance, who can forget “Flo” with Progressive? That is their voice. Other companies will use a type of voice for all of their marketing. For instance, they may be sarcastic, straight forward or bold just to name a few. Have you ever been scrolling Facebook and seen an image and without even looking you knew what company it was? That is what we call good branding. They are consistently using the same colors, fonts, types of images, etc, so that they have a consistent brand. This helps to make them easily recognizable. This is something a lot of small businesses don’t focus on because they don’t see the value. However, it means more than you know! Now that you’ve determined a name for your business and created a logo, it’s time to get your business online. This is oftentimes the last thing people do when they are ready to “kick-off” this business. This is by no means an exhaustive list, but it is the most important things for your business when you first get started. The best part is, most of these items are free. There are a lot of social media outlets now, almost too many to keep up with. While most business owners try to be active on all of them, I recommend focusing on one or two main ones. With that being said, the ones for you to focus on will vary depending on your clientele. If you serve a younger demographic, then Instagram may be better, if you serve an older demographic, Facebook may be better. I do recommend for you to grab all of the profiles with your business name so that no one else can take them. From there, you can determine which one(s) is/are best for you to use. Again, it will vary from person to person. Me personally, I don’t like to even mention Yelp simply because their business tactics are terrible. If you are just starting your business, you are being warned, Yelp will call and pester you to advertise with them. My advice: DON’T. I still do recommend creating a Yelp profile and asking clients to leave reviews because Yelp gets a lot of traffic an some people use their app to search for services. Fill out your profile completely, including hours, contact info, pictures and location (if you have one). One of my favorite hidden gems for listing your business online is Google My Business (GMB) (business.google.com). A lot of business owners don’t even know that GMB exist. This is a free listing that gives your business another opportunity to be found online. If you aren’t sure what GMB is, let me explain. Those listings that include the map location, phone number, website link, address and reviews is being pulled from a businesses GMB profile. A lot of business owners will set up their GMB but they won’t take time to set it up properly, or to optimize it. Quick note - if you are a mobile business or if you don’t want to share your physical location, you can still create a profile. When you enter your address you simply check “I service my clients at their location”. Google will show that you service a general area, but won’t display your address to anyone. This is perfect for mobile tanning businesses. When you first submit your business to Google they will require you to verify it. They usually do this by sending you a postcard via snail mail. Yeah, I know...how 2018 by Google! This is the way that they verify that each and every location is real and that people aren’t “gaming” the system. Google My Business is an AMAZING free resource that a lot of business owners don’t know of, or simply don’t take the time to fill out. These listings get a TON of traction and views on Google. In fact, look at the recent email I received from Google. It was letting me know that my review I left for a business had been seen over 950 times!! If you want more information straight from Google, here is a link that explains EXACTLY what Google says you should do for your GMB listing. Join 1,000+ spray tan artists!